About 4500 women are diagnosed with breast cancer in Israel each year and about 900 die of the disease. 1 out of 8 women in Israel may develop breast cancer, and the earlier the disease is detected, the higher the chances of a cure - reaching nearly 90%. Israel Cancer Association statistics demonstrate that the number of women who recover from breast cancer is steadily on the rise, thanks to early detection, enhanced treatment modalities and heightened awareness in Israel. Miri Ziv, ICA Director General: "Fear, lack of knowledge, or misinformation regarding breast cancer are factors that prevent many women from taking responsibility for their health, becoming acquainted with their breasts and undergoing early detection exams. About 90% of patients can be cured if the disease is detected at an early stage. Early detection is the most effective proven means of fighting breast cancer. It is highly imperative that starting from the age of 20 you become acquainted with your breasts and to the changes that take place in them. The better acquainted you are with your body, the better you will discern the changes should they occur; the next step is to consult with your physician to clarify the nature of such changes. A manual breast exam should be performed by your physician who specializes in breast examinations. Women who are 50 years and older should regularly undergo a mammography screening once every two years. Women who are at high risk, who have a mother or sister affected by breast cancer, should be tested once a year, starting from the age of 40, or according to their physician's recommendation. BRCA 1/2 gene mutation carriers are entitled to a breast MRI scan. It is important to keep in mind: the earlier the disease is diagnosed - the better are the chances of a cure! The Israel Cancer Association invites the female public to contact the 24H tele-information hotline service for answers to any questions that may have about breast cancer and other cancers, and to receive informative material free of charge. ICA, joining the rest of the world, initiated "Breast Cancer Awareness Month" held in October each year, as part of the national and global breast cancer awareness campaign. The ICA holds many events during this month to increase awareness about this subject. In October the ICA launches an extensive public education and information campaign in all the media channels, focusing on the importance of early detection and ways of treating breast cancer. Diverse events are held during the month to increase public awareness about the disease and the importance of early detection, namely: the Estée Lauder Companies' Global Landmark Illumination Initiative in collaboration with the ICA. ICA encourages women to adopt a healthy lifestyle which includes physical exercise, proper diet, and maintaining a healthy weight - strategies that can reduce the risk of developing breast cancer. You may find information about healthy lifestyle choices to maintain good health on the Europa Donna, European Breast Cancer Coalition website. The ICA-funded and initiated a National Mammography Screening Program that has been implemented for the past 20 years by the ICA, in collaboration with the Ministry of Health and healthcare funds: from population-based diagnostic radiology screening in Israel, to surgical procedures, pathological diagnosis and monitoring of women diagnosed with malignant tumors at oncology institutes. Prof. Gad Rennert, Director of the Community Medicine and Epidemiology Dept. at Carmel Hospital, and Advisor to the ICA on Cancer Control, oversees this program. The ICA-initiated National Mammography Screening Program statistics presented by Prof. Gad Rennert, Head of the National Programs for the Early Detection of Breast Cancer and Colorectal Cancer and Advisor to the ICA, indicate that gaps in mammography compliance rates noted in Arab women have been completely dissipated, and are identical to those of Jewish women, and also demonstrate a narrowing of disparities between different sub-populations in Israel. Current compliance rates in new immigrant and ultra-Orthodox female populations are about 5%-10% lower than those observed among native secular Jewish female populations. In 2001 the percentage of compliance to undergo mammography screenings among Arab women stood at 49%, and today, the compliance rate is similar to that of Jewish women, and stands at about 70%. 94% of women who were screened over the past year and showed no symptoms, complying to undergo the screening test recommended at the age of 50-74, had already been tested in the past, meaning women returned for additional testing as required by the National Mammography Screening Program. Since the inception of the National Program and to this very day, over 5 million breast imaging exams have been performed on over one million different women, of whom 95,042 were examined in the Mobile Mammography Vehicle. 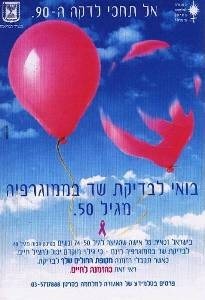 There are some 19,010 breast cancer patients and survivors in Israel today who were diagnosed with the disease from 2005-2009, who recovered, or are still coping with the disease, of whom 16,851 were diagnosed with invasive breast cancer and 2,159 were diagnosed with in-situ breast cancer. Invasive Breast Cancer: There has been a steady decline in incidence since the early 2000's as well as stability among Jewish women. An increase in invasive breast cancer has been observed over the years among Arab women. In-situ Breast Cancer: the incidence rates for in situ breast cancer have increased over the years among both Jewish and Arab women; the most prominent increase was observed in the 90's at the launch of the National Joint ICA-Healthy Ministry Initiative on Breast Cancer Early Detection. The percentage of women diagnosed with early-stage cancer has increased from 57% of patients diagnosed in 2007 to 62% in 2009. For the first-time ever, a decrease in mortality rates has also been recorded among Arab women: from 16.0 per 100,000 in 2008 to 11.9 per 100,000 in 2010. The mortality rates among Jewish females have dropped from 22.6 per 100,000 in 1998 to 17.1 per 100,000 in 2010. The statistics indicate a downward trend among Jewish women (about 30%) and Arab women alike (about 25%). The increase in the incidence of in situ breast cancer rates and the decline in mortality rates indicate the detection of the disease at its early stages, enhanced treatment and higher chances of a cure. There has been an upward trend in relative breast cancer survival rates, and the current survival rate exceeds 85%. According to International Agency for Research on Cancer (IARC) statistics which compare between countries with the highest incidence and mortality rates in the world, it emerged that Israel ranks high in incidence (5th highest), whereas, as far as mortality rates are concerned, Israel ranks lower (9th highest) and shows a downward trend. 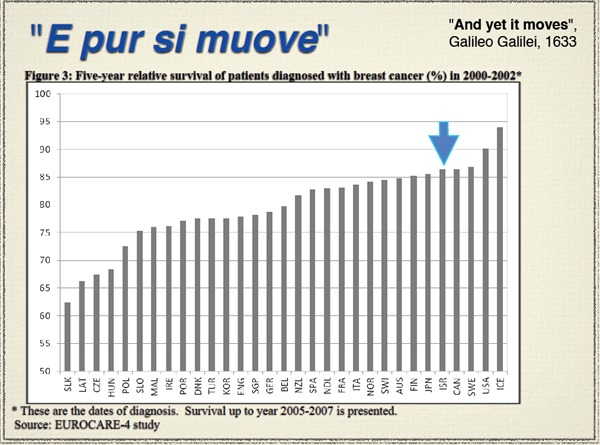 * Source: EUROCARE-4 European Cancer Registry-based study on survival and care of cancer patients. That breast cancer age-standardized mortality rates, from 1998-2009, decreased from 22.6% in 1998 to 17.4% in 2009. In other words, a 30% decrease! This proves that thanks to the National Mammography Screening Program initiated by the ICA, and thanks to its information and education efforts, women are diagnosed at an earlier stage, which enables quick and more effective treatment that consequently has live-saving impact. The ICA continues to finance special posts for nurses and social workers who work as breast cancer care coordinators and patient navigators during all stages of diagnosis, treatment and follow-up. The ICA project's goal is to accompany the breast cancer patient throughout the treatment process, and to provide her with information, support and assistance, thereby significantly easing the burden of coping with the disease. This service is currently provided in many centers across the country. Other centers have already adopted this service and the ICA continues to update personnel. Thanks to the ICA, there is a national network of professionals who maintain regular contact with breast cancer patients and attend to their wellbeing. The ICA Mobile Mammography Vehicle, currently run by Assuta Medical Services, is now in its 12th year of operation across Israel. The aim of the vehicle is to enable women who reside in remote areas, as well as those who are unaware of the importance of the detection test, to undergo a mammography screening close to home. The overall objective is to improve access to and compliance with this potentially life-saving screening test. In 2013, as a result of the great demand for mobile mammography services, an additional Mobile Mammography Vehicle began to operate. The Mobile Mammography Vehicle operates in collaboration with all healthcare funds. A personal invitation letter is sent to women of the appropriate age in anticipation of the arrival of the mobile mammography vehicle to the designated town, and ads are placed in the local newspapers announcing the mobile's scheduled activity in the area. Over the past year, over 15,000 women were screened in the Mobile Mammography Vehicle, including women who were supposed to have undergone screening years ago, but did not go get themselves checked because the screening institute was far from their home. The ICA continues to assist in operating regional early breast cancer detection stations throughout the country. The National Breast Health and Early Detection Awareness Program is conducted among the general female population. Countless resources are invested in diverse population segments such as Arab society, kibbutzim (collective settlements), the new immigrant population, the ultra-Orthodox sector, and other populations. Informational material is distributed in hundreds of thousands of copies in Hebrew, Arabic and Russian, and a breast health lecture notes kit has been updated for Breast Health Nurses who lecture throughout Israel on behalf of the ICA. In coordination with ICA's Health Promoter and Public Information and Education Dept., lectures continue to be delivered by breast health nurses representing the ICA. The nurses deliver lectures to the general population across Israel, to heighten awareness of the importance of breast cancer early detection and the significance of making healthy lifestyle choices which may reduce the overall risk of developing cancer and breast cancer in particular; additionally, these nurses shed light on ICA's noteworthy activity in Israel - for the patients and against the disease. This program featured lectures in different settings, such as women's clubs, corporate offices, municipalities and local authorities. The National Breast Health and Early Detection Awareness Month is conducted among the general female Israeli population to promote the fight against breast cancer. In October the ICA launches an extensive public education and information campaign in all the media channels, focusing on the importance of early detection and ways of treating breast cancer. Diverse events are held during the awareness month to increase public awareness about the disease and the importance of early detection, namely: the Estée Lauder Companies' Global Landmark Illumination Initiative in collaboration with the ICA. Countless resources have been invested in diverse sectors such as the Arab society, kibbutzim (collective settlements), the new immigrant population, the ultra-Orthodox sector, and others. Informational material is distributed in hundreds of thousands of copies in Hebrew, Arabic and Russian, and the breast health lecture notes kit has been updated for Breast Health Nurses who lecture across the country on behalf of the ICA.